Ok - here it goes. Our house has a raised seam metal roof. When we bought it it needed to be painted. I decided to do it myself so save money, gain experience and because I prefer to spend my money on buying the tools to do a job instead of paying someone else to do the job. First I bought a safety harness. The kind that wraps around both your legs and goes around your shoulders and clips in the front. The rope attaches to the back between your shoulder blades. If you actually fall off the roof, this is the only way to properly stop yourself. If you just have the rope tied around your waist, you're going to hang yourself; get sliced in half by the rope ; or snap you're back in half while inflicting major internal injuries to yourself. Do yourself a facor and purchase a fall rated D-Ring clip so that you can easily remove yourself from the rope. Those carabiners that the sell for you to use as a key chain in Home Depot WILL NOT WORK. 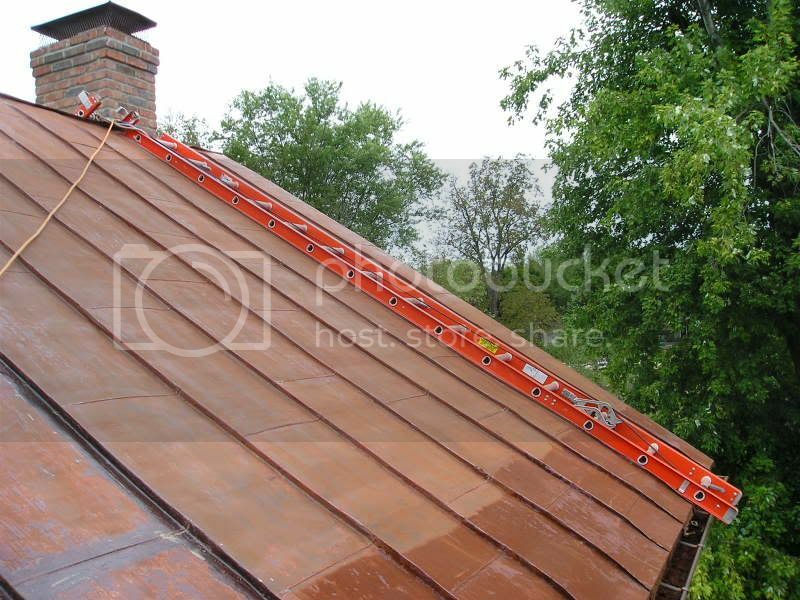 I was fortunate because my roof was set up with a nearly flat roof on the back half of the house so I only needed the fall protection when working on the front of the house. I was also fortunate to have large trees in the back yard to tie myself off to so I didn't need to invest in anchors that attach to the roof in order to secure my rope. I did not use a fall arresting approved rope, but I did purchase one that would support more than 3 times my weight and I tied a series of loops along the rope about 1 foot apart so that I could adjust how far the rope would let me go. This minimized the distance that I would be able to fall at any given time. This also meant no chance of free fall, only short slides down the roof could ever happen. I also took apart an extension ladder and draped one part over each side of the roof with a rope holding them together in the center. This, I was informed, is called a chicken ladder. I didn;t care what they called me I knew I wasn't likely to fall off the roof using the ladder like this. I prepped the roof using a 4 inch wire wheel on a drill. I just locked the drill trigger into place and let the wheel spin and take the heavy rust and paint off the roof. It took a long time and was DIRTY work. I wore a cartridge style respirator. If I felt that it was necessary to scrape anything I used one of those cheapo ALL PLASTIC scrapers. 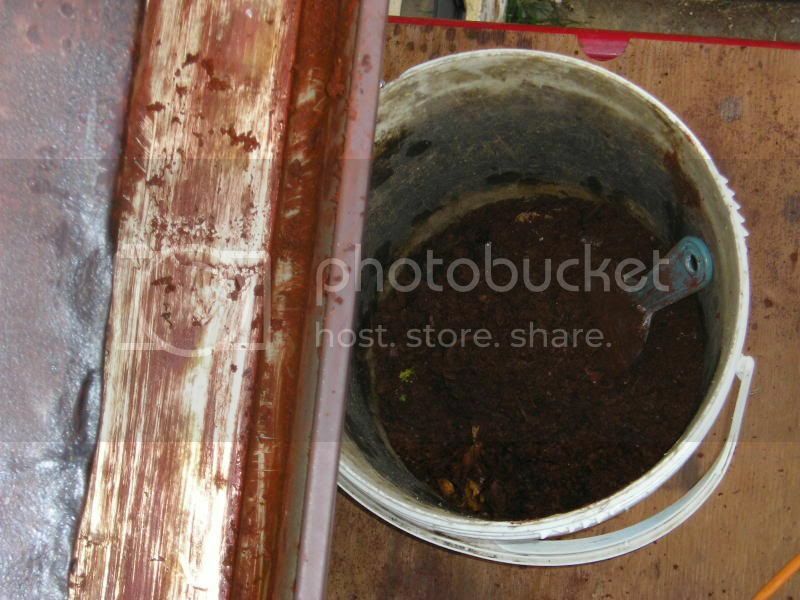 A metal scraper would put a hole through the tin roof in a second. Then you have another patch to make. Once a section is brushed off, I would broom clean it and them use a garden sprayer to spray a solution of TSP over that area to rinse away the dust and remnants of lead paint. Then I would brush the seams and ridges with a rust inhibitive primer and finally brush the flat areas in between. I used a brush because I wanted to make sure I didn't miss any spots. Here's a shot of the roof showing the rust inhibitor going on , the wire wheeled areas and the roof as it was before work started. After I was done working for the day I scraped all the paint chips out of the gutter, sealed them in a plastic bag and disposed of them (properly) so that they wouldn't contaminate the soil around the house. I Primed the roof with the manufacturer's recommended primer after the rust inhibitor was on the roof and then I applied two coats of the final paint. I used red as the first coat of paint and then put the final color (bronze) over that. Using two different colors for the final coats ensured that I would be able to easily see that I hadn't missed a spot. This was important because at this time I was working strictly off the scaffolding using a heavy knap roller on an extension handle. The red will also be a visual indicator that it's time to go up and paint again. My roof was in pretty good shape - no pinhles and only a couple of places that neded to be patched. Patching consisted of putting down a very heavy layer of the paint on the area, followed by a layer of heavy polyester reinforcemnt fabric sold by the paint system manufacturer. I was able to remold standing seams into the roof in areas where they had been removed and repatched with flat metal in the past. Once the fabric is set in place, coat over it a cople of times with the paint to complete the patch. Don't start too early in the day. let the dew evaporate before starting. Wear soft shoes on the roof so you don't damage the metal. Like running shoes. Stop painting several hours before dark. Like about 3 hours. Otherwise theres a chance that the paint won't set and it will run. Avoid painting in the sun. That tin heats up quickly and it cooks the paint before a good bond can form. Try to always paint on the shaded side of the roof, or at least the side that's not in direct sunlight. Scaffolding - WACO RED scaffolding - used scaffolding supplier. To purchase a safety harness search on google for "safety supplies" and narrow the search to "fall protection"
HB - been there - done that - what's next! What a job!! You're sure brave to take that on - even if you got to buy new tools! If it were me - I'd get all harnessed up and on the roof - then would have to pee. That's why I do my best work with a check book!! This would be a good entry in the "reference" sticky I'd think - very through explanation! thank you hb, you just made me decide to pay somebody to paint our roof! sounds like a lot of hard work, and we have so many other projects going. my wife wants a new roof, but ours looks solid and i think it'll last a decade if we paint it and maintain it. i love metal roofs! the po's painted it as a condition of sale, and now almost 2 years later it has all washed off. i think they used house paint, i will make sure we get acrymax paint. the only problem is- what color? it's blue now. maybe we'll go with something neutral like grey, since we plan on painting the house a different color next summer. i like the idea of 2 different colored layers so you can see when to repaint. very crafty! HB, you're my hero. 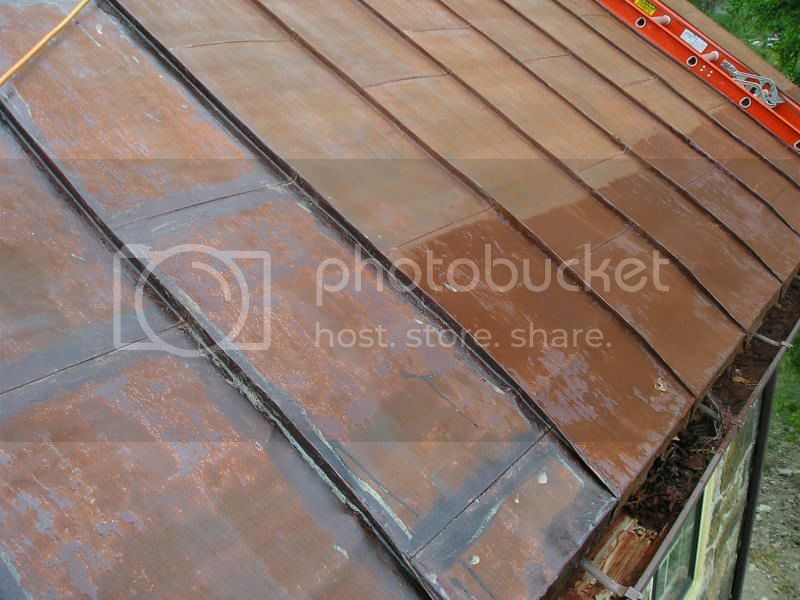 One of the jobs on my 'list' for next year is to scrape and paint the metal roof of my workshop building. Now I know how to do it and what to use. Woo hoo. that's amazing...what a good solid job you did--a lot of hard work too! It sure sounds like you thought about that whole safety harness business pretty good. Me too. I commited to painting the exterior of the house, but decided that I'd rather NOT kill myself in the process. The only difference is that I got a full-body harness that has the fall rope connection D-ring on both the front and the back sides so you can use either. I use the front side ring so that if I ever actually fell, I would be able to access the rope and clip. That's pretty hard if you dangling off the back side D-ring. You could not pull yourself back up the rope. I also got a 6 foot safety lanyard to hook-up with. It has an expanding type feature that eases the fall so it's not a SNAP stop. Kind of like a bungee cord. That wire wheel in a drill works well to get the rust off. I just did the same thing to get loads of rust off of an old parlor stove that I found at an antique store and then restored. But, I was taking ALL the rust off, down to bare cast iron, and did not need to worry about wearing right through thin sheet metal. It's real easy to wear a hole through rusted sheet metal with a wire wheel in a drill. I have a suggestion for you or others that may need to do the same job. Naval jelly is perfect for removing the rust from sheet metal without doing any harm and is WAY LESS WORK. Naval jelly is not exactly cheap, but it does seem to go a pretty long way. You just brush the jelly onto the sheet metal, using those rubber dishwashing type gloves. You don't want to get the stuff on your skin! Then, you wait like ten minutes and just lightly hose it off with water. The water will evaporate off the metal pretty fast. But you might want to use a leaf blower to dry out under those standing seams. Then go for the paint job. I like that chicken ladder trick! Hi Jack. I thought about using Naval Jelly, but I think that somewhere amongst my phone calls and research I learned that it was not a good treatment for the metal prior to using this particular paint system. I've used it other places and you're right, it works like a charm. Regarding the placement of the D-ring, that's a good idea to get one that mounts in the front. I just kept my cell phone in my pocket and only worked on the roof when my wife was home so there would be some hope for quick rescue. I will not "cheap out" on anything that is intended to save my life. I was invincible during my 20's, but not anymore. Originally, I bought 100' of real mountain climbing rope and figured that I could tie-off to the chimney, crawl the roof ridges and install hooks and pullies to work from. But then I got to thinking a bit more about it and said NO, I'm not that stupid anymore. I bit the bullet and bought the boom lift. Best decision I ever made! I feel so safe in the basket on the lift that I don't put on the safety harness unless I'm gonna get out of the basket. And I do get out of the basket. I built a wooden platform on both sides of the chimney that I'm replacing, to catch the demolition and keep it from falling off the roof and killing someone, and to work from during the project. I feel quite safe being still attached to the lift basket by the lanyard and safety harness. Installing this chimney will be loads of fun next weekend! Yes, I will get my wife to take pictures. That is one impressive job you did! Not for beginners, I must say. My brother was doing some tree trimming (up a ladder and foolishly while home alone) and somehow the ladder fell over leaving him hanging from a branch about 12 or 15 feet up over a pile of the limbs he had just trimmed! He hung on for dear life and waited for someone to pass by the house. Fortunately a woman walked by, but he had to convince her to stop and punch in the security code so she could open the gate to the stone wall around the property and put the ladder back up to him. He's lucky he didn't fall straight down onto the pile of sharp limbs. Around here people make wood chicken ladders and keep them up on the ridge all the time. I saw that you brushed on the rust inhibitor/converter or whatever it was, but how did you apply the final coats of paint? Did you brush those too? Did the paint manufacturer say anything about spraying?